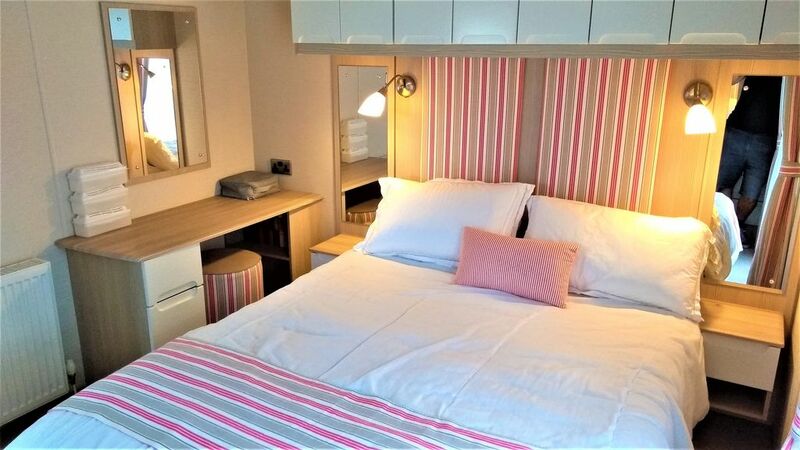 Bluebell is a delightful, modern comfortable caravan with veranda in a quiet location at the end of a cul-de-sac in Lytchett Bay View. Furnished to a high standard with wooden floor and rug in the lounge area. It is bright and welcoming with a 'seaside' feel. It has both double glazing and central heating. The lovely sandy beach is a few minutes away with beach cafe and water-sports available (extra charges apply). There is parking for one car. The kitchen is well stocked with everything you will need for your perfect break. Full sized gas cooker with grill, fridge/freezer, toaster, microwave and electric kettle. There is plenty of cupboard space for your food. Cutlery, crockery, glasses and kitchen utensils are all provided. In the dining area there is a rectangular light wooden table with four matching chairs. The lovely generous lounge has free standing furniture and a sofa bed that sleeps 2 if required. There is a modern coal effect gas fire and flat screen TV. A cosy rug covers the flooring and a small round coffee table is provided for your drinks.The patio doors lead to the enclosed sun terrace with fold up table and garden chairs. The master bedroom has a king size bed, an en-suite with toilet and basin and large fitted wardrobe offering loads of space for all your clothes. There is also a 19" flat screen TV. In the twin bedroom there are two single beds and a wardrobe. Additionally there is a family toilet and shower room. All of our caravans are dog friendly. There will be no extra charge for your dog, providing no damage is done and no extra cleaning is required. Please let us know when booking if you would like to bring your dog as conditions apply. Duvets and pillows are provided. However you will need to bring bed linen, towels and tea towels. FunWorks passes which give access to Haven activities and facilities are not included in our prices which are for the caravan hire only. Duvets and Pillows are provided however you will need to bring your own bed linen, towels and tea towels. Internet is not included in the price. Internet can be purchased at Havens Reception. Park Passes to Havens facilities are not included in the price. Central heating working on Fridays arrival, no hot water. Informed owners and site reception but no one turned up to fix it. By Sunday still no hot water, no communication from owners, we decided enough was enough and cut our stay short by 24hrs, as we were unable to shower etc. Cleanliness was poor, Rug in lounge area filthy dirty. Although the caravan had been cleaned, all the cupboards and cooker were greasy and sticky. WiFi was only intermittent which we had not been told about and free for only 30mins per day per device. After that you have to pay! Overall a very unsatisfactory stay.